–Shakespeare’s Hamlet, Act III, Scene I. While Prince Hamlet was actually contemplating suicide (or joking about it) in this often misappropriated scene, it’s undeniable that sleep–and dreams– can be crucial factors in our successes in our waking lives. On the other hand, sleeping patterns, like definitions of “success”, can be extremely different from one person to another. What seems to work for someone else might not necessarily be the best thing for you or me. Big Brand Beds came up with this fun infographic outlining the often quirky sleeping habits of the rich and famous throughout history. We’ve all got different sleep requirements, depending not just on what our bodies need, but what our jobs entail. You wouldn’t want your neurosurgeon to be bragging about how little sleep they got. Donald Trump must be either lying or totally lacking in empathy if as the infographic claims he “can’t understand how someone who sleeps more can compete with those who get fewer hours.” Kind of ridiculous given the biggest reason for his success is that he was born to rich parents. Sleeping through long stretches throughout the night, or “monophasic sleep” only became widespread with the introduction of gas and electric lights. Before then, most humans followed a “polyphasic” sleep pattern, where most slept short periods throughout the day. However, there is no real evidence Leonardo Da Vinci ever followed the so-called “Uberman” sleep pattern. Margaret Thatcher, Barack Obama, Richard Branson, and Donald Trump among others, probably weren’t commuters like most of us and doubtlessly rely or relied on drivers who hopefully get enough sleep. Always get enough sleep before operating a vehicle or heavy machinery. Never pull an all nighter and drive. 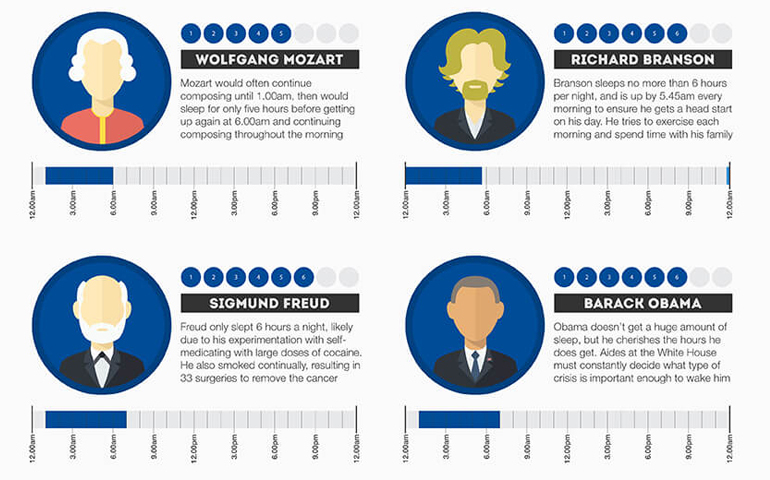 While theinfographic seems to indicate people who sleep fewer hours are more successful, it also omits wildly successful people who have gone on record stating they considered 7-11 hours of sleep crucial for them to be at their best. Siestas seem to be the best compromise for those who want to be more alert throughout the day, but can’t sleep 8 hours straight for practical reasons. Sleep patterns are at least partially cultural. Something to take note of for Americans working in the Hispanosphere or East Asia. People who brag about how little sleep they get is just something you have deal with. Just do what’s best for you. How much does sleep matter for you? Comment below!